Preheat oven to 375 degrees F. Saute vegetables in olive oil on medium heat for approximately 10 minutes or until soft. Place eggs, mayonnaise & milk in a bowl. Mix well. Combine cheese and vegetables and pour into the 9-inch frozen pie crust. Place on a cookie sheet or other sturdy pan in the middle rack of the oven. 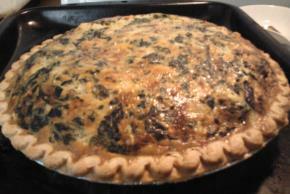 Bake for 45 to 50 minutes or until quiche is set.